Home > Used Vehicles > 2010 Toyota Venza Base,AWD,LEATHER,SUNROOF,AIR,TILT,CRUISE,PW,PL,VERY CLEAN, LOCAL TRADE,CLEAN CARPROOF!!! 2010 Toyota Venza Base,AWD,LEATHER,SUNROOF,AIR,TILT,CRUISE,PW,PL,VERY CLEAN, LOCAL TRADE,CLEAN CARPROOF!!! On Sale! Save $1000 on this one, we've marked it down from $14900. 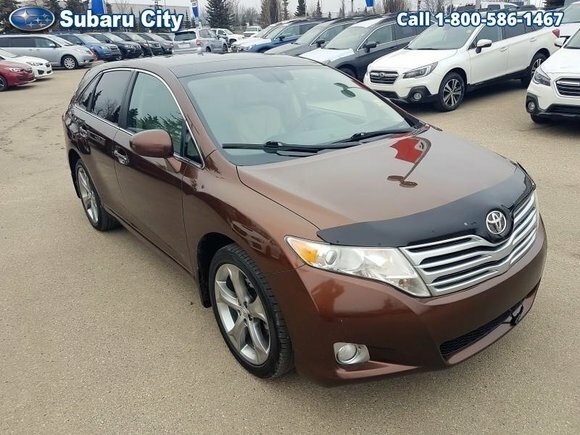 This 2010 Toyota Venza is fresh on our lot in Edmonton. The 2010 Toyota Venza is a tall, midsize wagon aimed at consumers seeking a generous helping of space and amenities in a five-passenger vehicle. With plenty of room for passengers and cargo and the driveability of a mid-size sedan, the Venza is a comfortable family hauler.This SUV has 148446 kms. It's sunset bronze mica in colour. It has an automatic transmission and is powered by a 3.5L V6 24V MPFI DOHC engine. Buy this vehicle now for the lowest bi-weekly payment of $197.52 with $1543 down for 36 months @ 6.99% APR O.A.C. ( taxes included, $790 Administration and Secure Ride included / Total cost of borrowing $1525 ). See dealer for details. Want to try the 2010 Toyota Venza Base?